The Mountain View Police Department super duo of Katie Nelson and Chris Hsuing just achieved ELGL-NIOA crossover content status! Their original post “The Vital Role of the Public Information Officer” from ELGL.org was cross published today in the National Information Officer Association, or NIOA, national newsletter to members. ELGL loves sharing content with other organizations that work to support local government public employees, and NIOA is no exception. NIOA membership is open to anyone actively employed by any local, county, state or federal government agency, or any public safety or emergency services organization, whose primary responsibilities include managing or disseminating public information. The NIOA exists to serve the needs of the professional information officer through professional networking and ongoing educational opportunities. 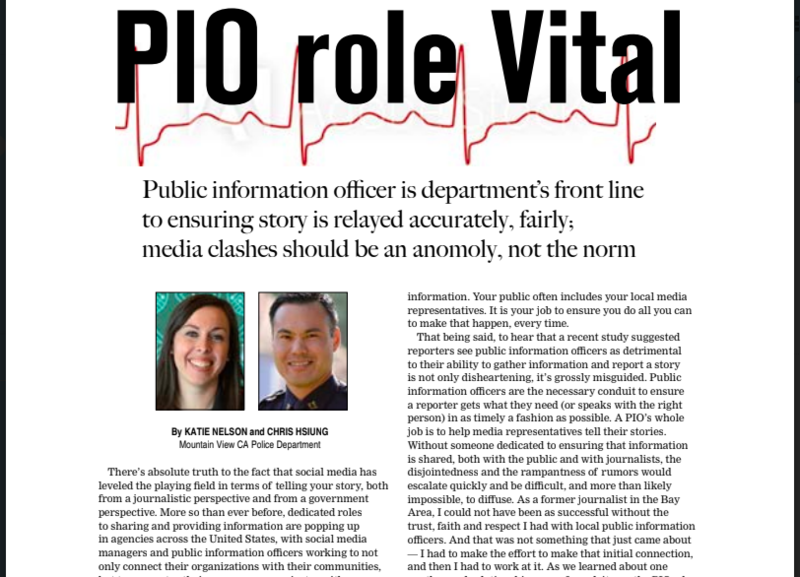 As a Public Information Officer (PIO), you understand the critical importance of developing and maintaining relationships with the media, the need to stay abreast of the latest trends in the rapidly changing communications industry, and the necessity of continuing training and education. Now you can be part of a network of hundreds of PIOs from across North America who share your concerns and work together to help improve the standards of the profession – the National Information Officers Association (NIOA). The NIOA was founded in 1989 as the only national organization devoted exclusively to representing and meeting the needs of emergency services and public safety information officers. The NIOA promotes professionalism and encourages stronger media relations by providing educational information, training opportunities and regional support for the information officer. NIOA members are spokespersons from local, state and federal government, representing law enforcement, fire, medical, emergency management, transportation, public works and other public safety and emergency services agencies. As NIOA continues to grow, it is gaining power as a unified voice representing professional emergency services and public safety information officers across North America. In the future the NIOA Board intends to continue its efforts to address policy issues and ethics, facilitate and strengthen regional and inter-agency PIO professional relationships and provide additional continuing educational opportunities for its members. Your involvement in NIOA will strengthen your ability to relate to the media and improve both your skills and confidence when handling all types of incidents, from the mundane to major crises. Both you and your agency will greatly benefit from your membership in the NIOA.